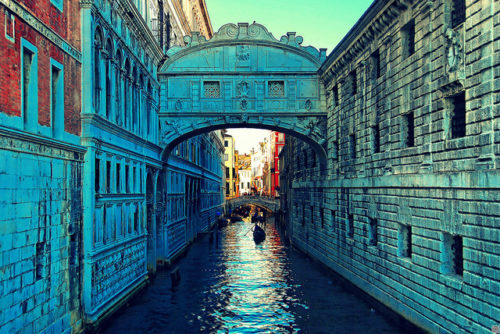 Venice has got over the centuries a singular name: the “City of Bridges” in the historic centre over the lagoon. Lovers, artists and poets used to come over here and try a Venice Gondola Ride on the most important canals of Venice. Thanks to the “waterways”, you can park your car at the entrance of the city and reach the historic centre by foot or by boat. The “vaporetti” are the most spread ways to move in Venice with lines that pick/drop you off at different points of the town. A fantastic recipe from Venice is the Bigoli a particular kind of pasta. Does it sound exotic but delicious? You should try to make it, following the recipe we arw about to write. You should make a mound of the flour in the center of a large wooden board. Make a well in the middle of the flour and add the eggs and milk in which you have melted the butter. Using a fork, beat inside the eggs and begin to add the flour. The dough will come “alive” and in shape when half of the flour has mixed with the eggs and the milk. Knead the dough with both hands, using the palms. Once the dough has got more compact, remove the dough, flour the board and keep on kneading for 5 minutes. The dough will be elastic but still a little sticky. Dust with flour your board when the mass is too sticky. Finally, wrap the dough up in plastic and let it rest for 30 minutes at least at room temperature. Take the dough out the wrapping and start kneading until smooth and tight. Let the mass rest for about 20-30 minutes. Cut the dough into 8 pieces, and pass every piece through a meat grinder set to the smallest size. Cut the strands of bigoli in smaller pieces and dust them with flour. Lay on the board abundantly dusted and keep the strands separate!!! This entry was posted on Saturday, September 15th, 2012 at 6:39 pm	and is filed under Discover Italy. You can follow any responses to this entry through the RSS 2.0 feed. You can leave a response, or trackback from your own site.